This security poster illustrates the TMA-5 Yugoslavian Anti-Tank Mine. This anti-tank mine operates using two single chemical pressure/friction fuze. This minimum metal mine has a rectangular, plastic body, and each corner of the body is fitted with a mounting feature to allow the mines to be stacked. This security poster features illustrations and descriptions on how to disarm the TMA-5 Yugoslavian anti-tank mine and the TMA-5 Yugoslavian anti-tank mine’s specifications, fuze, and operation. 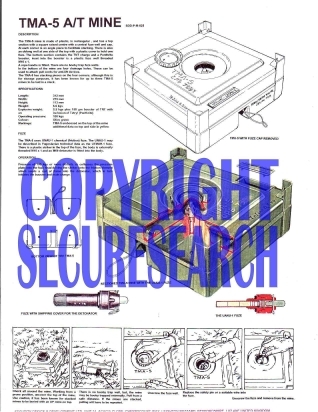 This security poster also shows a sectioned TMA-5 mine with the UANU-1 fuze, a bottom view of the TMA-5, a TMA-5 with fuze cap removed, the fuze with shipping cover for the detonator, and the UANU-1 fuze. A TMA-5 with fuze cap removed. A sectioned TMA-5 mine with the UANU-1 fuze. A bottom view of the TMA-5. The fuze with shipping cover for the detonator. Illustrations and descriptions on how to disarm the TMA-5 Yugoslavian anti-tank mine. The TMA-5 Yugoslavian anti-tank mine’s specifications, fuze, and operation. This security poster features illustrations and descriptions on how to disarm the mine, the mine's specifications, fuze, and operation, a sectioned TMA-5 mine, a bottom view of the TMA-5, a TMA-5 with fuze cap removed, the fuze with shipping cover for the detonator, and the UANU-1 fuze.